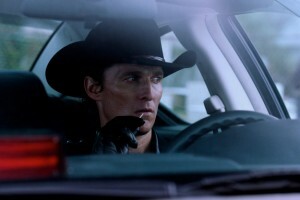 Matthew McConaughey surveys the scene in Killer Joe. Matthew McConaughey (The Lincoln Lawyer), Emile Hirsch (Savages), Juno Temple (Dirty Girl), Thomas Haden Church (Easy A) and Gina Gershon (Breathless) star in the 2011 crime-drama thriller Killer Joe. Finding himself in considerable debt, Chris (Hirsch), a Texan drug dealer, decides the only solution is to murder his mother (Gershon) to collect the insurance money. Getting together with his father, the ex-husband of Chris’ mother, they decide to hire contract killer Joe Cooper (McConaughey), who also happens to be a police detective. The plan is that the money will go to Chris’ sister Dottie (Temple). However due to the size of the contract fee, Chris agrees that Joe can take Dottie as a retainer until the insurance comes through. Wouldja believe that not everything goes as planned!? Based upon the play by Tracy Letts (who also wrote the screenplay), Killer Joe is directed by William Friedkin (The Exorcist), who helmed the 2006 thriller Bug, an earlier Letts play. Though generally well-received by critics when it arrived for a limited release to theaters in July, 2012, the R-rated film rang up only $2 million at the domestic box office. Bonus features on the discs include a commentary by Friedkin and a handful of featurettes.